I only write music for flute and clarinet. I don't need bass clef. It is default in all the scores. How do I remove it? In version 4.2, we’ll be introducing a command to unlink a grand staff automatically, so that you’ll be able to remove the extra staff from the Instruments Menu. But for now, you can still unlink the staff manually by following the steps below. If you need any clarification, don't hesitate to ask. 3. Within the Copy/Paste menu items, first select 'Edit Groups' (as illustrated above), then select "Remove Part Group'. This splits the grand staff into two separate instruments. 5. Note that the former grand staff is now listed as two separate instruments for the top and bottom staff. Swipe left on the instrument tab corresponding to the unneeded staff, then tap the delete icon that will show up. Hi is it possible to delete the bass clef for a certain number of bars? Or maybe when there are no notes in it? Also, is it possible to put a clef halfway through a bar? This can't be done yet, but will be kept in consideration. – The above is possible by first selecting a note at which the clef change should begin. – Next open the Note Properties Context Menu by choosing the 'Edit' menu item (ideally in Select mode) from the context items that will appear above the note. – You'll then find clef changes available under Note Properties, as illustrated here, with 'Symbols' selected at the bottom menubar. 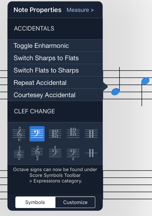 – To remove a mid-measure clef if undo isn't an option, it will be necessary to un-toggle the highlighted clef icon, by following exactly the preceding steps and deselecting the icon to have this action reflected in the score.